Is It Necessary to Use Roof Underlayment on Your Home? Your roof is a much more complex structure than you may realize. A simple layer of asphalt shingles is insufficient to provide proper protection from the elements, and in most regions of Maryland, the typical house features a roof with several components. The most important components of a roof are water-resistant or waterproof membranes, metal flashing, drip edges, and shingles. Since a wide range of skills is required to repair or replace a roof, it is best to leave all roofing jobs a trusted professional such as The Roof Replacement Pros. Our experienced roofers are ready to assist you and ensure the roof underlayment of your home is correctly installed. Underlayment is the layer of a roof located beneath the roofing material and above the roof’s deck. This is an essential part of any roof because it provides additional water protection and efficiently prevents leakage into your home. 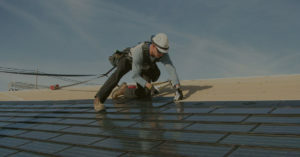 Roofing underlayment is installed before the outer elements of the roof, such as the shingles. This component of your roof provides a better barrier to weather damage and helps your home remain dry and safe even when your shingles are damaged. When roof underlayment is installed correctly, it also adds insulation value and increases fire resistance. There are three main types of roofing underlayment – asphalt-saturated felt, synthetic underlayment, and rubberized asphalt underlayment. Felt made of asphalt-soaked paper, also known as asphalt-saturated roofing underlayment, was used until the last two decades. If you have ever seen a roof being built, you might have noticed black rolls of paper that form the base of the roof. Those black rolls are asphalt-based roof felt. This layer of underlayment is easily attached to the roof with staples, and it is the first layer of protection between your roof and weather elements. Nowadays, asphalt-soaked felt is rarely used. Leading roofers, such as The Roof Replacement Pros use synthetic polypropylene sheeting in the construction of roofing underlayment. Synthetic roofing underlayment is more resistant to tears and wrinkling and allows moisture to pass. Unlike paper felt, synthetic felt is not adversely affected by humidity. This breathable synthetic component prevents moisture damages more efficiently than paper felt because it allows water vapor to escape from the roof deck. Without a breathable underlayment, moisture that comes from the inside of your home may accumulate in the roof deck and potentially cause severe problems. Since different types of underlayment materials vary in their breathability, it is best to contact us to determine the level of breathability that your roof requires. You can use underlayment for both commercial and residential projects. Another improvement in roof underlayment is rubberized self-adhered roofing underlayment. These barriers consist of a sheet made of asphalt and rubber polymers. Rubberized asphalt roofing underlayment has a self-adhesive design that provides excellent protection against rain, snow, and ice. If you live in colder or wet climates, you will find this type of underlayment very useful. However, not all roofs necessarily have to be built with a rubberized water barrier. Do I Need Roofing Underlayment? Maryland homeowners need roofing underlayment to ensure their home is well protected from moisture. Roofing underlayment is not an extra layer of protection, but an essential part of your roof. Your shingles serve as the first line of defense against the elements. However, since they aren’t sealed at all corners, moisture can easily get in when they are damaged. Roofing underlayment provides you an additional protection that shingles alone cannot give to your home. Apart from water resistance, top benefits of installing roofing underlayment are ice damming resistance, protection during roof installation and repairs, and a more polished finishing touch to your roof. High winds and ice damming protection: If you live in an area prone to high winds or ice damming, instead of using water-resistant roof underlayment, we recommend installing waterproof roofing underlayment. Protection during replacement and repairs: Although underlayment provides protection all year round, it may become particularly useful during new roof installation or repairs. Underlayment will efficiently keep water, wind, and debris out of your home until the roof job is completed. A uniform look for your shingles: Underlayment will hide the look of any uneven areas of your roofing deck and provide a more polished finishing touch. How to Choose the Right Roof Underlayment? Our experts can recommend different layers of protection for your home based on the type of roof you have installed, its slope, and the climate in your region. As we mentioned before, underpayments are very important because they do not only protect your home from water and moisture, but also from fire. Roofing underlayment is a very important aspect of your roof structure. If you are thinking about replacing your roof, make sure you talk to The Roof Replacement Pros about your best options. We can ensure your roof provides optimum protection to your home for many years to come at an affordable price. We currently service Gaithersburg, Olney, Bethesda, Germantown, Montgomery Village, Laytonsville, Sandy Spring, Potomac, North Potomac, Rockville, Silver Spring and Chevy Chase.